Sparc Enterprise M server partners Oracle and Fujitsu have upgraded the entry-level Sparc Enterprise M3000 rack-based server with a faster Sparc64-VII+ processor. The two companies announced the quad-core Sparc64-VII+ processor last December. The chip is designed and fabbed by Fujitsu, which also designs and manufactures the entire Sparc Enterprise M line of servers sold by both Oracle and itself. If you are keeping track of code names, this quad-core processor was originally the "Jupiter-E" on the Fujitsu roadmap, and Oracle sometimes refers to it as the "M3" chip, short for the third generation of chips for M-class Sparc servers. That is distinct from Oracle's own multicore, multithread Sparc T series chips, which are put into entry-level and midrange servers that are sold by both companies. Back in December, the top-end Sparc64-VII+ chip had four cores, 12MB of shared L2 cache, and ran at 3GHz. Fujitsu said that thanks to the larger cache, some other tweaks, and a modest clock-speed boost over the quad-core 2.88GHz Sparc64-VII parts, customers should expect about a 20 per cent boost on commercial workloads. Not all machines were upgraded to the full-speed 3GHz chip, by the way. The four-socket M4000 and eight-socket M5000 midrange machines got a 2.66GHz version of the Sparc64-VII+ chip, while the 16-socket M8000 and the 32-socket and 64-socket M9000 machines received the full-on 3GHz part. This is a staggered pattern that Fujitsu has used for years, saving the highest clocks for the most expensive boxes. With Tuesday's announcement, the Sparc Enterprise M3000 – the entry-level single-socket server designed by Fujitsu – is getting its Sparc64-VII+ bump with a 2.86GHz chip sporting 5.5MB of L2 cache. Oracle is again telling customers to expect about a 20 per cent increase in performance on commercial workloads compared to the quad-core Sparc64-VII chip, which only had 5MB of L2 cache on the die and which ran at 2.75GHz inside the M3000 machine. This performance claim is based on some SPECfp_rate2006 benchmark test, but I have a hard time believing that a 10 per cent bump in L2 cache and a 4 per cent increase in clock speed will yield that kind of performance increase on a lot of commercial workloads. Fujitsu and Oracle are offering two-core or four-core options for the Sparc64-VII+ inside the M3000 server running at the same 2.86GHz clock speed. An entry two-core chip was also available with the prior M3000s. The companies are also offering solid state drives (SSDs) as an option for the chassis for the first time, and touting the fact that running Solaris 10 and the Smart Flash Cache feature of the Oracle 11g R2 database (which is only available for Solaris) can significantly boost the performance of Oracle databases – by how much, the two did not say. Oracle is also pitching the updated M3000 as a consolidation box for older Sun Fire V series entry-level machines, with the consolidation being enabled by Solaris Legacy Containers that can prop up Solaris 8 and 9 environments atop a Solaris 10 container and run them unchanged. Oracle says you can replace two Sun Fire V445 servers with a single M3000 and keep the same performance levels. 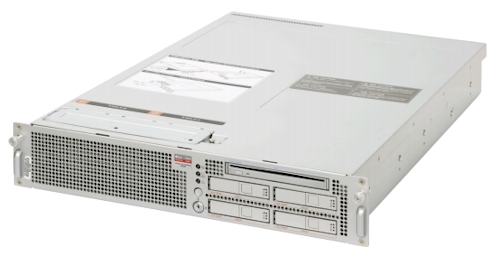 The Sparc Enterprise M3000 server comes in a 2U chassis that has room for four 2.5-inch disk drives or SSDs and a CD/DVD drive. Using 8GB DDR2 memory sticks, it can support up to 64GB of main memory. It has four PCI-Express x8 slots for peripheral expansion. A base two-core box with 8GB of memory – four 2GB sticks – plus two 300GB 10K RPM SAS disks costs $20,821. That's considerably higher than the $15,821 Oracle was charging for the same machine configured with a two-core 2.75GHz Sparc64-VII chip. The top-end machine has four cores on the Sparc64-VII+ chip, 32GB of main memory, and two 300GB disks; it costs $39,821, the same as the former top-end part using the older and slightly slower chip. While Sparc customers who use the M3000 as a development machine, or perhaps as boxes that they cluster to create smaller Oracle 11g RAC database clusters, will no doubt look forward to having a little more oomph, the upgrade to the M3000 announced today with the Sparc64-VII+ is looking a little long in the tooth, particularly with its DDR2 main memory. It is time for the M4 chip or whatever it will be called, but Oracle and Fujitsu are not expected to get the next Sparc64 chip out the door until 2012.